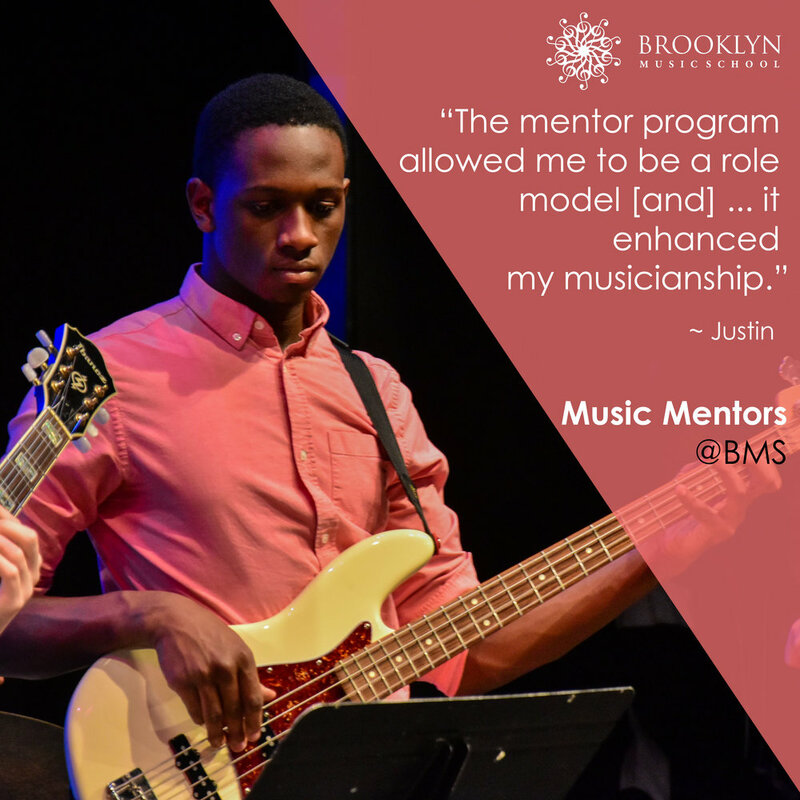 The Brooklyn Music School is proud to offer a Mentor Program that allows 80% of our students ages 15-25 to receive some type of scholarship to support their continued music education through BMS. BMS Mentors are individuals who provide a positive influence, both musically and personally, to younger BMS students. For information on the program and how to apply, please contact Rafael Rosa, director of the BMS Mentor program. what does being a music mentor mean to me? I am exposed to a variety of opportunities relating to music education and musical performance. I am able to explore both the teaching and learning sales of music education. As a mentor, I’ve been able to observe and help out with teaching classes. One thing that really stood out to me was the way classes were taught. Since my school doesn’t offer music theory classes, this school allows me to deepen my understanding of the technicalities of music. Before theory class, I didn’t have much knowledge on the difficult types of chords and how they relate to each other. In addition, I’ve gotten various performance opportunities. For example, I’ve been able to perform with the youth and adult orchestras, as well as play solo in the recital. Before studying at BMS, I did not had many performance opportunities, so I immensely grateful for those that BMS provides me. I’ve also been able to develop some meaningful friendships. I’ve never been able to make many friends with the same passion for music, and part of this community pushes me to develop my musical abilities and understanding. When I first emailed the Brooklyn Music School asking if I could help teach violin, I was just looking for a way to combine my interests of music and education. The mentor program provided so much more. Last year, I worked with 5 and 6 year olds learning to play violin. I didn’t expect it to be as fun or educational as it was – the kids were always eager to come to class. Now I’m having even more fun with the child and adult and orchestras. It’s an amazing experience that has helped me grow as a musician and as an educator. Another aspect of the mentor program is the working with the other mentors. Each week we have theory class together with Rafael. The music theory class at my school was boring, confusing, and I didn’t learn anything. This class is the complete opposite. Each week we learn something new, and we always have a good laugh at the end. All the other mentors are incredibly talented and kind, and have become some of my best friends. In the year since I came to the Brooklyn Music School for the first time, the mentor program has become a way to give back to my community, become a better teacher and musician, and to meet new friends. The Music Mentor program means a lot to me. I’ve loved being a part of the program for the last few years. Working with the children in the Summer Institute and ARY program has been very rewarding because I’ve gotten the chance to see many of them develop into better musicians over the years. It’s also been interesting to assist many different teaching artists and seeing how different methods of teaching can help different kids. I’ve really enjoyed helping out backstage during recitals and shows. Doing work backstage in theatre as a stage manager or a stage hand is something I am considering as a possible career path, and helping during shows has given me experience beyond musicals and plays, especially since I also got to help during the operas as an assistant stage manager. BMS has been a very valuable resource for me because of the many chances that the mentor program has given me to work backstage. I’ve also loved the friendship I’ve made through the program. Everyone is passionate about music and helping to pass on that passion to the younger student. I think of many of the other mentors as my brothers and sisters. The mentor program and BMS in general create a sense of family. The mentor program has always been a big part of my high school life. As a high school freshman I had loved music and wanted to pursue the career of teaching it. The mentor program had not only allowed me to be a role model to those younger than me, but it enhanced my musicianship. Over the course of four to five years I have participated in rock and jazz band where I have met amazing musicians. The music artists within the Brooklyn Music School are generous and courteous towards the mentors. This family friendly music school has brought my love for music to new heights as I was always excited to show up. I have been honored to take part in gigs at the Sidewalk Café as well as a Music School Belgium. There has never been a boring day while participating in the mentor program. There is always something new to learn as every day passes. As my senior year progresses, new people appear just as eager to learn as I was. When I leave the program for college I anticipate there will be a new wave of musicians that will take part in the program with the same eagerness and passion. To me, the mentor program provides an outstanding opportunity to dive more into music than just the base of it. The program provides opportunities to get ”behind the scenes” during performances, in addition to joining ensembles. I love the mentor program because it has helped me gain friends and feel as if I’m part of a larger family that shares the same love for music as I do. I feel like I’m part of family of educated musicians that have assisted greatly in furthering my musical experience and have inspired me to pursue in music when I’m older. 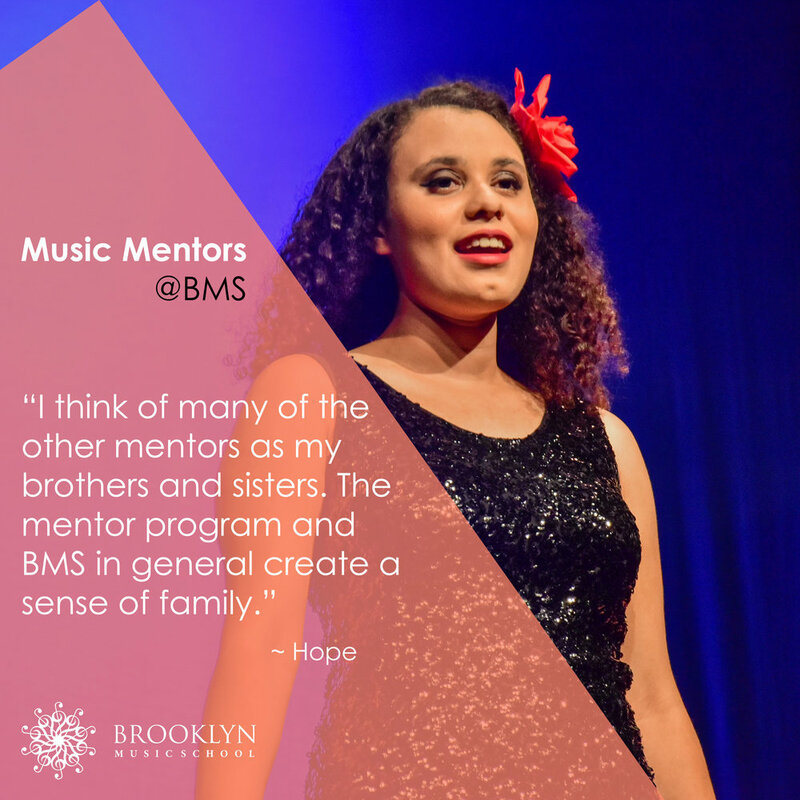 The Brooklyn Music School’s Mentor Program means so much to me. The program provided me so much confidence, endless opportunities, wonderful friendships and be able to be exposed to a wide variety of music. I wouldn’t have known a lot about jazz, blues and many different contemporary music. For me, I only know popular music and classical music and haven’t been given an opportunity to analyze each music. I really enjoy working with kids and share my passion of music to the younger students. I haven’t taught anyone anything before and being like a mentor in the classes gave me confidence on my secondary instrument, violin. I really enjoy helping out with concerts. Helping out in the TCS Marathon and monthly concerts was extremely interesting. Being able to mingle with other mentors really improve my morning? skills. Without this mentor program, my confidence level wouldn’t be that high. Especially playing music because I’ve always been judged by my peers. But this program really changed that. The opportunities here or endless. Being able to work with successful adults and musicians is a great way to gain more connections which is very important in my future, especially when I need to find jobs. The wonderful times I have while working with other mentors in my quartet is indescribable. Being in chamber music before, I didn’t really enjoy as much because no one really took it seriously. This program also really helped me to time manage since I do a lot of other extracurricular activities. It also helped me to get all of my college recording done.